December marked the 14th consecutive month of positive total returns for the S&P 500. The prior longest winning streak had been twelve months, so this is an unprecedented occurrence. Coho finished the year with a monthly gain of 2.1%, besting both the S&P 500 and the S&P 500 Value, which returned 1.1% and 1.7% respectively. Stock selection was the driver this month with more follow through from some of our holdings that had lagged earlier this year. The monthly winners included Lowe’s, up 11.5%, AmerisourceBergen, up 8.3%, as well as Kroger, J.M. Smucker and W.W. Grainger, which were all up over 6%. We also had a strong 4th quarter with a gain of 7.8% which compared well against the S&P 500’s return of 6.6% and the S&P 500 Value’s gain of 6.3%. We were particularly pleased by those results because “cyclicality and beta” were favored and we tend to de-emphasize those characteristics, so once again, stock selection was the primary reason for the outperformance. For the full year, Coho lagged the S&P 500 posting a 19.4% annual return against 21.8% for the S&P 500. While we always like to outperform the benchmark, the 89% upside capture is well within the 85% – to 90% range we target in up markets such as this one to deliver our pattern of returns designed to generate above market returns with below market risk over a full market cycle. Our performance against the S&P 500 Value was positive, as that index rose a more modest 15.4%. In earlier commentaries, we noted that “growth” greatly outperformed “value” and this was a headwind for us throughout the year. In a similar vein, the most cyclical companies led performance as evidenced by the top three performing sectors for the year consisting of Information Technology, Materials and Consumer Discretionary. The gap between “growth” and “value” of 12% (or 1,200 basis points) as measured by the S&P 500 Growth Index total return of 27.4% and the S&P 500 Value Index return of 15.4% is the largest since 2000. It is possible that this gap may narrow as 2018 unfolds because in December the FAANG companies (Facebook, Apple, Amazon, Netflix and Google) struggled against both the S&P 500 and the S&P 500 Growth Index as seen on Table 1 below. Needless to say, all of these companies had enormous gains for the year. 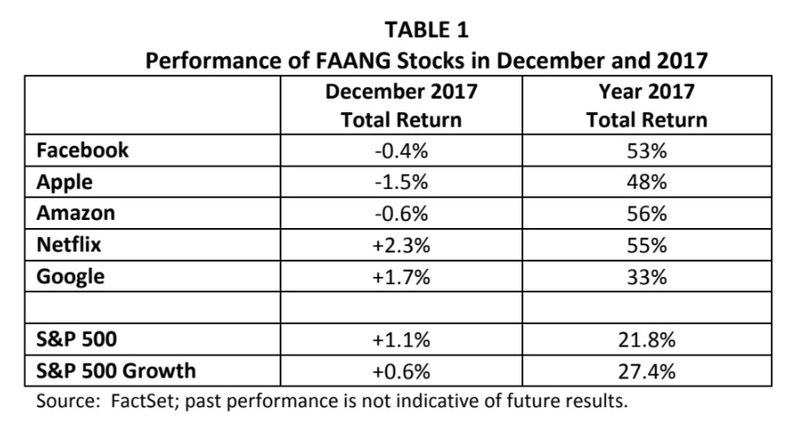 If this trend continues, it would likely benefit our returns on a relative basis since only one of the FAANGs (Google) is in our Coho 250 Universe and those five companies alone accounted for 4.3% of the entire 21.8% return for the S&P 500 in 2017, or just under 20% of the total. As we look to 2018, we see some positives, but we also have some concerns. On the positive side, lower corporate tax rates should be a marginal benefit, which when added to the solid economic backdrop, could result in another year of double-digit earnings-per-share growth for the S&P 500. The better tax treatment for off-shore cash should also increase flexibility for capital allocation (dividends, buybacks, capital spending, mergers/acquisitions), which should be a material net positive for valuations. It is still very early, but we have seen some companies raising wages and expanding variable bonuses for employees due to the lower corporate tax rates, which if it continues, could spur better consumer spending, confidence and financial flexibility. As for the new tax rates and brackets for individuals, this seems less of a market benefit but not a negative from our perspective. From a monetary policy perspective, it is unambiguous that the Federal Reserve’s intentions are to raise rates in a measured way so as to sustain or enhance the current GDP growth rate and not ignite inflation. Given where Fed Funds currently are, we believe there is ample room for numerous quarter point hikes before bonds become a more compelling option than equities. Looking into 2018, we expect all of the portfolio holdings, apart from CVS to increase their dividend, with the latter focusing on reducing leverage associated with the anticipated acquisition of Aetna before resuming dividend hikes. Possibly the greatest risk in 2018 is simply current equity valuations, despite prospects for another year of solid earnings-per-share growth for the broader market. We just completed the ninth consecutive year of positive returns following the financial crisis in 2008. Over this period, P/E multiples have risen, dividend yields have fallen and “bargains” have become harder to find. We would not be surprised if our historically low turnover (12% in 2017) increased somewhat as we anticipate higher volatility and we want to capitalize on new opportunities where we can improve the overall portfolio’s expected return while simultaneously reducing risk. We remain focused on our philosophy of downside protection first and foremost, while still participating during market advances. Looking back, it has been an enjoyable nine years of positive market returns. Over this period, the S&P 500 has advanced a remarkable 259% versus Coho’s return of 246%. Further gains could come, but caution seems to be warranted at this time. We believe the portfolio is properly positioned to “protect and participate” in 2018. Once again, the entire Coho team is grateful for your confidence in our services and we wish you a wonderful New Year.